Dona Ana County Fire Dept. 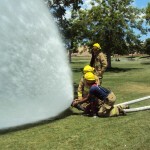 NMSU Fire Department employs 14 student firefighters. We look for applicants who are motivated, disciplined, dependable and team orientated. We are seeking full-time students at NMSU or DACC who have a minimum of two years left in their degree plan. Student firefighters are expected to obtain their college degree and serve as a firefighter to the community. In this demanding position one must accept the roles and responsibilities of a firefighter. NMSU Fire Department firefighters meet the same qualifications and standards as professional firefighters in the industry. If you are willing to show commitment to the fire service and succeed; upon graduation you have several qualifications to add to your resume. You will show your future employer the dedication and long-term commitment you are capable of giving. Note: A student does NOT have to seek a degree in a field related to firefighting to be a qualified applicant. Positions are posted as vacancies occur. Integrity, positive attitude, loyalty, respect for the organization; others and oneself. Eligibility standards are set by Student Employment. An applicant must meet student employment eligibility in order to be considered an applicant for a student firefighter position. The applicant has to be a current student or enrolled in the following semester. The applicant must be enrolled in a minimum of 12 credit hours. The applicant must be in good financial standing with NMSU or DACC. The applicant’s GPA must be a 2.5 or higher. These are the required qualifications in the first year of employment for the fire department. Initially pass a background check and physical. National Incident Management System Training (NIMS). Student firefighters are assigned to a shift. The work schedule is one day on – one day off. All of your classes must be scheduled Monday through Friday 8 AM to 5 PM. These are times you will not be required to be on shift. Shift work on week days starts at 5 PM and ends 8 AM, on weekends shift starts at 8 AM and ends at 8 AM. You will be required to work during summer breaks, winter breaks, and holidays. The Fire Department will present an orientation prior to the testing process. This is where staff will provide information about employment at NMSU Fire Department and answer your questions you may have. The hiring process consists of two sections a physical agility evaluation and an interview. 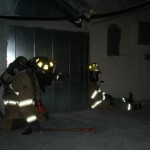 The physical agility portion of the test is related to fire ground tasks. Examples of these tasks are: pulling a charged line, heavy tool carry, and dummy drag. The interview process is a panel type interview with fire officers sitting across from you; they will be asking pertinent questions. You are expected to be dressed in professional attire for the interview. This is a competitive process and if chosen, you will be titled as a probationary firefighter. All student firefighters are assigned a dorm room within the fire station. In your assigned room you can study during down time, watch TV, and sleep. If an emergency occurs (911 calls), you will be required to be on your assigned apparatus. Being a firefighter is a lifestyle not a job! 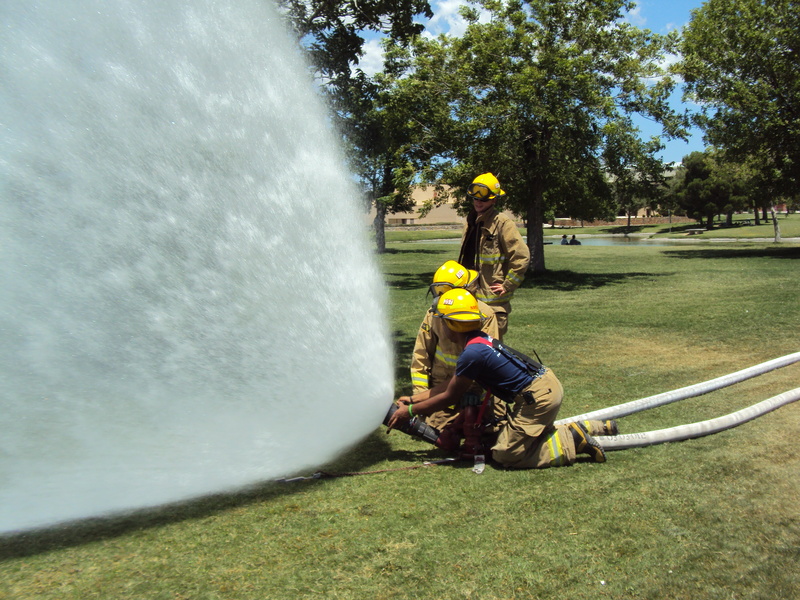 Student firefighters are initially trained using the NM Firefighter Task Book, which is the minimum qualification to be a firefighter in New Mexico. This must be completed within 90 days of hire and part of in-house training. Once the task book is completed, NMSU Fire Department reimburses the firefighter upon completion of the next available EMT-Basic class through DACC. NMSU Fire Department also provides in-house training programs for Driver Operator, Company Officer and Technical Rescue. NMSU Fire Department may reimburses members upon completion of the EMT-Advanced course through DACC. Various other training and certifications are offered as they are needed such as Wild Land Firefighting, Vehicle Extrication, ATV Driver Qualification, etc. After you submit your application, it will be reviewed and eligible applicants will continue in the hiring process. If you have been selected, you will be notified by email the next process. Please make sure you are checking you email because you must confirm acceptance! Please check back often for open positions. Any new positions will first posted on our home page.